One of the world's major ski centres and a sizable, picturesque town with a good range of shops, restaurants and alternative sports options. A key resort in the huge Portes du Soleil lift-linked region. When will it snow in Morzine? The next notable snow forecast for Morzine is 19cm8in, expected on 26 April, with around 42cm17in forecast over the next 7 days. The French Ski Resort of Morzine is part of the Portes du Soleil ski area with access to 400km249 miles of downhill skiing, with 285 marked pistes, served by a total of 196 ski lifts. In addition to the skiing in Morzine itself (107km66 miles of pisted ski runs), the appropriate ski Lift Pass will allow you to ski or snowboard in the other Portes du Soleil ski resorts of Abondance, Avoriaz, Châtel, La Chapelle d'Abondance, La Grande Terche, Les Gets, Montriond, Saint Jean d'Aulps, Champoussin, Champéry, Les Crosets, Morgins and Torgon. With ski lifts as high as 2,460m8,071ft, snow cover is generally reliable. Morzine offers skiing in two similar sized sectors which together offer almost 300km (nearly 200 miles) of trails served by nearly 100 lifts. It's part of the Portes du Soleil ski area which links a dozen ski resorts by lift and offers skiers 650km (just over 400 miles) of more-or-less-lift-linked trails that cross from France in to Switzerland. The longest possible descent in Morzine is 11km7 miles long and the most difficult run is the 'Creux', which is 3km2 miles in length. Morzine's first ski area links the resort over to neighbouring Les Gets on the slopes of Mount Ranfolly, between the two villages. With skiing between 1000m (3280 feet) and 2000 m (6560 feet) the trails are largely easy or intermediate level, down through the densely forested, tree lined, slopes. The second sector is that of Super Morzine and Avoriaz, rising to 2466m (8090 feet), known for its long slopes to which skiers would venture in the spring before the resort was built and lifts installed in the '60s. Beginners are very well provided for, with excellent nursery slopes dotted around Morzine, most just a short walk from the accommodation. Skiing the Portes du Soleil gives a sense of travel, and of encountering different cultures as you cross the border in to Switzerland, with views of Mont Blanc in one direction and Lake Geneva in the other. It's possible for most skiers above beginner standard to make the most of the huge terrain on offer, with numerous Blue Runs linking the area. Advacned skiers too will find plenty of interest, with a number of Black Runs and the World Cup descent down from Avoriaz to Morzine over a full 1100m vertical. In the d'Enfer there are excellent off piste runs from La Grande Terche. Of course there is also the most famous run of the whole area, 'The Swiss Wall' - unofficially categorized a brown run, officially Black. Many choose to take the chairlift down rather than face its monstrous moguls! Snowboarders needing high adrenaline action are likely to head up to the facilities of Avoriaz (home to one of Europe's largest fun parks) or the snowboard park at Les Gets. We don't currently have confirmed season dates for Morzine. NOTE:- Lift and Piste openings are always subject to Snow Conditions in Morzine. Morzine is able to make snow, on 130km81 miles of ski runs, with 322 snow cannons. The 67 ski lifts of Morzine are able to uplift 256,000 skiers and snowboarders every hour. Morzine is in the French Alps in Portes du Soleil, Haute-Savoie, France. The nearest airports to Morzine are Annecy, Geneva and Chambery. There are nine airports within three hours drive. The Webcams in Morzine are not always up-to-date. Please check the date on the image to ensure you are seeing current snow conditions. Morzine is a relaxed and family-friendly resort and the night-life reflects this, with early evening drinks and snacks followed by a good meal of traditional fayre. After that there are dozens of bars to choose from, with Dixie Bar, the Coyotte Bar and Le Crépuscule usually all lively. Later on much of the action is to be had in the bars and discothèques at the Le Pleney end of the resort. Popular night spots include Opéra Rock and Le Paradis. Other evening activities include bowling, night skiing, snowmobiling and even ice hockey matches. A village with a history dating back to long before Morzine was first named in documents in 1180 AD, today Morzine is a large and pleasant resort in the midst of one of the world's largest ski areas, the Portes du Soleil, and with excellent off-slope facilities. Although the village may have existed for at least a thousand years, tourism only arrived rather more recently when the first hotel, the Grand, opened in 1925. The first brochure stated that Morzine was located ...high above the damp mists, where the purifying breeze blows through the firs. Early visitors included many families of diplomats living in the French colonies. Winter tourism was not long behind initial summer business and in 1934 the opening of the Pleney cable-car made getting up the mountain to go downhill easy. François Baud, the pioneer behind the Grand, went so far as to build a ski jump behind his hotel, to employ Austrian ski instructors and to bring in the earliest tracked Renault vehicles to entice winter visitors. He also introduced the sport of Ski Jöring - being towed on skis behind a horse - to the village. After Pleney, the Pointe de Nyon was introduced as a second ski area and Jean Vuarnet won Olympic Gold at Squaw Valley, helping to underline further Morzine's growing pre-eminence on the winter-sports world map. The still futuristic resort of Avoriaz opened high above the village in 1966 and when Super Morzine opened in the 1980s a lift link between Avoriaz and Morzine was created. Want to Know when it Snows in Morzine? 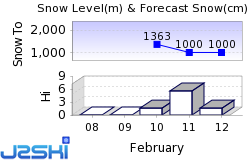 Click above to get Snow Reports by e-Mail for Morzine. By doing so, you agree to Our Rules. Other Ski Areas within Portes du Soleil. Other popular Ski Areas near Morzine. Want to ask about skiing and snowboarding in Morzine? Or contact Morzine Tourist Office. Note :- The information on J2Ski concerning Morzine, where not clearly factual, is opinion only and is neither definitive or exhaustive.